Love makes the world go round they say. How true is that? Wars have been waged, rebellions have been fought for the sake of Love or lust. Who is responsible for such emotions even in creatures that seem so far away from human emotions? 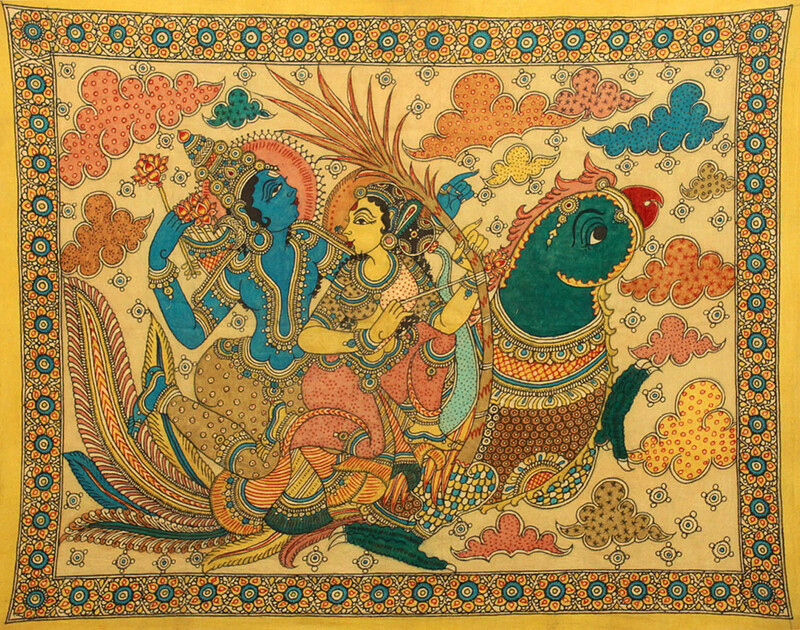 Kama Deva and Rati – The Hindu gods of Love, lust, and desire are said to be the cause. The name Kama-deva (IAST kāma-deva) can be translated as ‘god of love’. Deva means heavenly or divine. Kama (IAST kāma) means “desire” or “longing”, especially as in sensual or sexual love. The name of the goddess Rati comes from the Sanskrit root ram, meaning “enjoy” or “delight in.” Although the verb root generally refers to any sort of enjoyment, it usually carries connotations of physical and sensual enjoyment. Etymologically, the word Rati refers to anything that can be enjoyed; but, it is almost always used to refer to sexual love. Armed with flowery arrows, Kamadeva is thought to have been born of the creator god Prajapati’s heart without the aid of any female component. In some versions, Kamadeva arises from the mind of the creator god, Brahma. According to Kalika Purana, after the creation of the 10 Prajapatis, Kama (Kamadeva), the god of love, was created from Brahma’s mind. Kamadeva is ordered to spread love in the world by shooting his flower-arrows and Prajapati Daksha is requested to present a wife to Kamadeva. Kamadeva first uses his arrows against Brahma and the Prajapatis, who are all incestuously attracted to Brahma’s daughter Sandhya (“Twilight-dawn/dusk”). Shiva, who was passing by, watches them and laughs. Embarrassed, Brahma and the Prajapatis tremble and perspire. From the sweat of Daksha rises a beautiful woman named Rati, who Daksha presents to Kamadeva as his wife. Kama Deva is represented as a handsome, winged young man who wields a bow and arrow. His lethal weapon of love is a bow made of sugarcane with a string of honeybees and the arrows are adorned with five kinds of fragrance to incite every sense- the Asoka tree flowers, the lotus, the blue lily, the jasmine and the mango flowers. The Asoka tree flowers represent fertility and the lotus represents purity in life and the blue lily represents peace and tranquility, the jasmine induces the heightened sensitivity related to seduction and the mango flowers prosperity and fulfillment. He’s also called Madana the one who intoxicates. According to the Silpa Sastras, Kamadeva is to be formally portrayed with the season of spring, Vasanta, and the Makara banner is to be carried by a horse-faced being, whose appearance connotes the virility of horses. In addition to the Gandharvas and apsaras that are depicted with Kamadeva, his green parrot vehicle, or vahana, is traditionally shown at his feet and a mythical sea animal called a Makara is depicted on his banner. The appropriateness of Kamadeva’s vehicle is demonstrated by the affectionate nature parrots show toward one another and their human-like capability for speech. These two qualities, along with the fact that parrots are monogamous, give credit to the notion that parrots are wise to matters of the heart. Kamadeva’s consort Rati, whose very essence is desire, carries a discus and a lotus, her arms are compared with lotus-stalks. She is unparalleled in her beauty and appeal, creating desires amongst others. The Kama is known in Hindu mythology as a victim of Siva’s anger. A demon named Tāraka, having greatly distressed the gods, they wished to destroy him. But only a son of Siva could accomplish this. In consequence of his intense grief at the loss of his wife Sati, Siva had unfortunately become insensible to love. The gods, therefore, instigated the Kamadeva to assist by wounding him with his arrows. At last, he was successful, just as Pārvati (Sati in a new form) was near, who at once captivated the stricken deity. Angry with Kamadeva for his presumption, he caused a flame to issue from his third eye, which consumed the god who had interrupted his devotions. In the “Vamana Purāna” is a lengthy account of the effect of Kāma’s arrows. The wounded god could find no rest. He threw himself in the Kalindi River, but “the waters were dried up and changed into blackness; and ever since, its dark stream, though holy, has flown through the forest like the string that binds a maiden’s hair.” As he wandered about from place to place seeking relief, the wives of the saints in the forest of Daruvanam forsook their homes and followed him. The Bhāgavata continues the story as follows:—Rati, the wife of Kāma, being almost mad with grief at the loss of her husband, entreated Pārvati to intervene with Siva that he might restore him to life. Pārvati encourages her by showing how her wish will be gratified. “He will be born as the son of Sri Krishna, and his name will be Pradyumna. A demon named Sambara will carry him off and cast him into the sea. Having entered the body of a fish, he will re-appear in the food of Sambara. Go, take up your abode in the house of Sambara, and when your husband arrives, take him and bring him up; eventually, he will slay Sambara and will live happily with you.” Acting on this advice, Rati became a servant in the house of the demon. When Pradyumna was but six days old, he was stolen from the lying-in chamber by Sambara, terrible as death; for the demon knew (having been told by the sage Nārada) that Pradyumna, if he lived would be his destroyer. Sambara cast him into the sea, the haunt of the huge creatures of the deep. A large fish swallowed him, and he was born again from his body: for the fish was caught by fishermen and by them delivered to the great asura, Sambara. His wife Māyādevi (the Bhāgavata says, servant), the mistress of his household, superintended the operations of the cooks, and, when the fish was cut open, saw a beautiful child. Thus counseled by Nārada, Māyādevi took charge of the boy, and carefully reared him from childhood, being fascinated by the beauty of his person. The affection became still more impassioned when he was decorated with the bloom of adolescence. The gracefully-moving Māyādevi, then fixing her heart and eyes upon the high-minded Pradyumna, gave him, whom she regarded as herself, all her magic and illustrative arts. It is said – that it was on the day of Holi that Kama Deva had sacrificed himself for the good of all beings. It is believed that among the many different legends around Holi, the festival of colors, and the traditional bonfire that is lit on that day, also commemorates the Kama Deva legend. So, many people also worship Kama Deva on Holi, with the simple offering of a mixture of mango blossoms and sandalwood paste, to cool off the pain of his fatal burns. Songs are also sung in which Rati’s sorrow is depicted. He is believed to be forever traveling the three worlds accompanied by his wife Rati. Rati is the perfect match for Kama Deva. In beauty she is unparalleled.